In a large saucepan, bring water, cumin, curry, turmeric, salt, and pepper to a boil. Remove pan from heat, add bulgur, stir to incorporate, cover with foil, and set aside for approx. 20 min. In the meantime, finely dice red onion, bell pepper, cucumber, parsley, mint, and dill. Cut green onion crosswise into thin rings and tomatoes into bite-sized pieces. 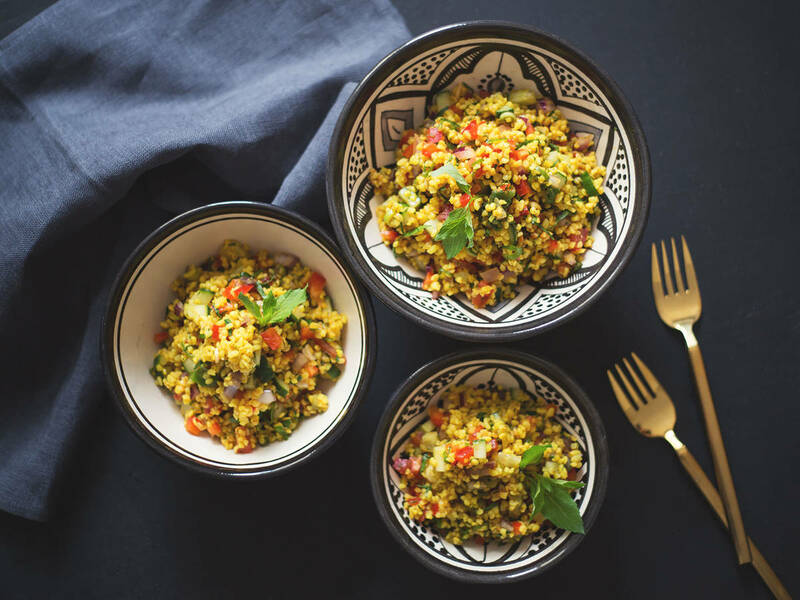 In a large bowl, thoroughly mix together bulgur, tomato, red onion, green onion, cucumber, parsley, mint, dill, chili flakes, olive oil, tomato paste, and lemon zest and juice. Season to taste with salt and pepper. Enjoy!